Buildings constantly change and develop as architects, engineers and scientists innovate and develop new products and construction methods. Interest has been growing worldwide in the design and construction of high-rise timber buildings, which are increasing in number throughout Europe and other parts of the world, as engineered mass-timber products such as glulam and cross-laminated timber (CLT) become more popular. In the United States, high-rise buildings using mass timber for the structure are being planned and constructed, based on the need for sustainable architecture, driven by building owners, managers and designers who see timber as a positive solution. Although considered ambitious by some, high-rise timber buildings are becoming a reality in the United States. The two most-popular forms of timber construction are light-timber framing and mass timber. The two have many fundamental differences when it comes to fire performance. Light-timber construction is encapsulated within non-combustible gypsum drywall to achieve protection from fire. Mass-timber construction is characterized by section sizes that are typically 12 inches (300 millimeters) or more, and the products are “engineered,” being factory made from smaller sawn wood. These include glulam, CLT and laminated veneer lumber (LVL), among others. When exposed to fire, mass timber achieves fire resistance through the insulating benefits of charring, a process of inherent protection based on the section size and mass. Mass timber is becoming popular because it offers an economically favorable construction method for mid- and high-rise building types. Mass timber provides lighter construction that can result in savings in foundation works when compared to other materials. Another advantage is the amount of offsite prefabrication that allows for highly accurate production, leading to faster overall construction times. Quicker construction further reduces costs and increases return on investment. Mass timber also is quieter in construction, involves a smaller work crew and is safer overall. Owners and developers looking for a highly sustainable building solution also can achieve their goals through mass timber. What Does the Code Permit? The primary barrier to high-rise construction in mass timber is code limitations. Each U.S. state adopts one or more model building codes, and all 50 states adopt the International Code Council (ICC) International Building Code (IBC), with some states also adopting the National Fire Protection Association (NFPA) Life Safety Code, otherwise known as NFPA 101. Many states further amend the model codes to provide the basis for construction compliance. Other codes and standards impact construction, fire-protection systems, maintenance and firefighting operations, including the International Fire Code (IFC). Albina Yard is a medium-rise Type IV building in Portland, Ore. Within the IBC, timber can be utilized in Types III, IV and V construction. Types III and IV can be constructed to a maximum building height of 85 feet. The American Wood Council (AWC; www.awc.org) and WoodWorks (www.woodworks.org) provide resources and technical guidance on how timber construction can be utilized to maximize height and area. The IBC requires buildings with an occupied floor above 75 feet (defined as “high-rise”) to have an increased level of fire protection and structural performance. Represented by construction Types IA and IB, non-combustible construction is required for the primary structural elements (i.e., columns, beams, floors and load-bearing walls). Fire-protection standards include automatic smoke detection, voice alerting, sprinkler protection, pressurized fire-exit stairwells and fire-service access elevators. The structural protection also is increased for high-rise buildings, with a minimum two-hour fire-resistance rating (FRR). The primary structure is required to have sufficient resistance to survive full burnout of a fire, in the highly unlikely scenario where the sprinklers fail and the fire department has limited intervention. Compared to a mid-rise building, there’s a significant increase in expected structural performance for all high-rise buildings in a fire. As Type I construction requires a non-combustible primary structure, approval for a high-rise mass-timber structure requires the proposal of an alternative engineering design. This is permitted by the “Alternative materials, design and methods of construction and equipment” clause within the IBC. Undertaking an alternative engineering approach, or a performance-based design, is subject to approval by the authority having jurisdiction. 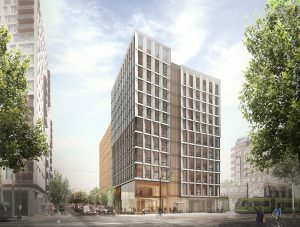 Architectural renderings show the Framework project, a 12-story masstimber building to be constructed in Portland, Ore. The methodology for developing an alternative engineering design will vary between jurisdictions, but the approval process typically depends on proving that the high-rise mass-timber building provides fire safety that’s equivalent, or better, when compared to a code-compliant building of the same height, area and use. A high-rise mass-timber building normally will have code-complying means of egress, fire-protection systems, protection of fire spread to neighboring buildings, and firefighting access and facilities. The only non-compliance is the use of mass timber for the primary structure. Because the use of mass timber for high-rise construction is new in the United States, the method for approval is largely consultative with regular meetings between the project team and approval authority team. The meetings allow information to be presented, questions to be raised and to determine the documentation required. The process for approval involves a significantly higher level of scrutiny. The Framework project (www.frameworkportland.com), for example, is a new 12-story mass-timber building to be constructed in Portland, Ore., for which the approval process involved Building Codes Division Oregon, the Office of the State Fire Marshall, and Portland Fire and Rescue. During the permitting process, meetings were held on a regular basis to discuss key construction issues and methodology for meeting the fire-safety objectives and criteria of the Oregon Structural Specialty Code. The permit process also involved an independent reviewer through design and permit stages. How Are High-Rise Timber Buildings Constructed? Mass-timber suppliers have stepped up in recent years to provide more code-compliant solutions to allow for easier approval and construction. The key aspect is documentation for proving fire resistance of primary structure elements. The IBC states a number of methods for compliance, with fire testing the preferred approach. Testing must meet either ASTM E119 or UL 263, which apply a standardized heating regime to a loaded building element to determine the fire rating. 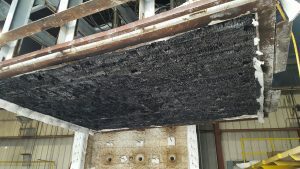 A two-hour fire test was completed on a CLT panel. 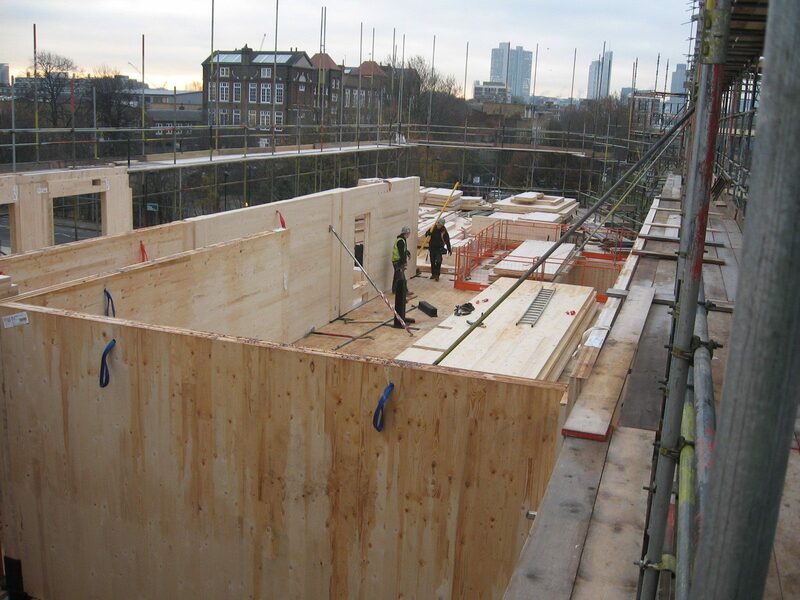 All North American CLT suppliers have had their CLT panels fire tested to meet ASTM E119, demonstrating a two-hour FRR. These test reports are available from each supplier to support the use of their products as load-bearing floors or walls. Another code-compliant method for proving an FRR is using the calculation methodology from the CLT Handbook or the National Design Specification (NDS) for Wood Construction. Building interior finishes also require fire testing to meet the criteria of ASTM E84, which provides a classification of how flames will spread on a material and the smoke that develops. Most engineered timber products have been tested to this standard and have classifications that allow them to be used as an interior finish in most building applications. For exterior wall assemblies, normally consisting of a rainscreen, insulation, water-resistive barrier and support framing, a fire test to NFPA 285 is completed. For all buildings, documentation proving the load-bearing structure provides the appropriate FRR, surface finishes have the minimum flammability and the suitability of an assembly as an exterior wall, are provided by evidential fire testing. This documentation of proven fire performance is the basis to any building fire-safety solution. Mass-timber buildings that utilize CLT as the primary wall and floor elements have very limited or no concealed spaces within the primary structure, due to the solid timber construction of CLT and glulam. Spaces for building utilities can be pre-formed with gypsum drywall solutions providing fire separation, similar to other forms of construction. Therefore concealed spaces, which are an issue for potential fire spread, are mostly eliminated with mass-timber construction. Connections in mass-timber construction aren’t as uniformly specified. CLT panel-to-panel connections are specified by each supplier, with the connections having been fire tested as part of a wall or floor assembly, to meet ASTM E119. The timber supply industry has been slow to develop standardized fire-rated solutions for glulam connections in high-rise buildings. 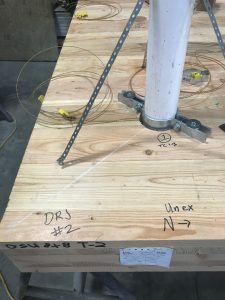 Glulam connections are addressed through calculation methods and, where required, through fire testing to ASTM E119. “Through penetrations” occur in all buildings for plumbing, electrical cables, telecommunications, heating and cooling. For penetrations in CLT walls and floors, the installation of a collar, fire mastic or fire damper that has been previously tested for use in a CLT wall or floor penetration is specified. Currently, there are few of these products available in the United States, and more fire testing is underway to increase the catalog of products available to designers. Fires during construction are a significant issue with light-frame timber buildings, given that the fire protection of gypsum drywall and sprinkler protection aren’t installed and active until after the building is fitted out. This places the building at risk of fire until detection and suppression systems are completed. A major advantage of mass-timber construction is that structural members, such as glulam and CLT, do not rely on additional protection measures, such as drywall, to resist fire. The required structural fire ratings are provided by each member as soon as it is installed. Preventing fires from starting in the first place always is important, and the methods used include sequencing of fire-protection systems, eliminating cooking onsite, improved nighttime security and hot-work supervision (where required). Most mass-timber buildings have no need for welding or grinding, eliminating one of the major ignition sources. The use of NFPA 241, Standard for Safeguarding Construction, Alteration, and Demolition Operations, as well as AWC’s Construction Fire Safety Practices website, provide a means by which to reduce the fire risk and consequences of construction fires. Despite the many positive attributes that mass-timber construction provides—including sustainability, efficiency in construction, safety onsite and quietness during construction—mass timber sometimes is viewed negatively. Prescriptive code legislation currently limits mass-timber buildings, and, in many jurisdictions, a reluctance to allow alternative engineering solutions has limited construction to mid- and low-rise buildings. 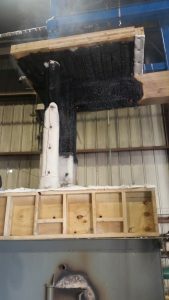 A photo shows the results of a completed one-hour fire test of a glulam beam to column joint. This is primarily due to a lack of familiarity with the material as well as limited understanding of the extent of fire testing and data available to the design community. 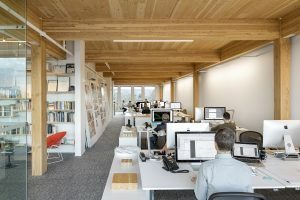 Continued education by organizations such as WoodWorks, reThink Wood and AWC are key to increasing the number of skilled architects, engineers and contractors with mass-timber experience. Through penetrations are being prepared for fire testing to ASTM E814. Also of significance, the ICC has convened an Ad-Hoc Committee on Tall Wood Buildings to investigate, research and address future code changes to allow mass-timber buildings to be built above 75 feet. The committee currently is considering code changes and fire protection to permit mass-timber construction at 12 floors or more. As knowledge and understanding of mass timber’s fire performance continues to develop, so does the potential for change in building codes. Through increased education to improve the understanding of how timber performs in fire, and through targeted research to assist with the implementation of innovative timber elements, the industry should expect to see more high-rise timber buildings being constructed. American Wood Council (AWC), 2015, “National Design Specification for Wood Construction,” Leesburg, Va.
Barber, D., Crielaard, R., Li, X., 2016, “Towards Fire Safe Design of Exposed Timber in Tall Timber Buildings,” Proceedings of the World Conference of Timber Engineering, August 22-25, 2016, Vienna. Buchanan, A., 2001, Structural Design for Fire Safety, John Wiley and Sons. Craft, S.T., et al, 2011, “Investigation of the Behaviour of CLT Panels Exposed to Fire,” Proceedings of the Twelfth International Conference, Fire and Materials. Frangi, A., et al, 2008, “Fire Behaviour of Cross-Laminated Solid Timber Panels,” Institute of Structural Engineering, ETH Zurich, Zurich, Switzerland. Kimball, A., Hoehler, M., Su, J., 2017, “Fire Safety Challenges of Tall Wood – Report on Cross Laminated Timber (CLT) Compartment Fire Tests,” NFPA Conference and Expo, June 4-7, 2017, Boston. Karacabeyli, E., Douglas, B., 2013, CLT Handbook, U.S. Edition, FPInnovations SP529-E.
Klippel, M., Schmid, J., Frangi, A., 2016, “Fire Design of CLT,” paper submitted for joint event of COST Actions FP1402 and FP1404, KTH Stockholm. White, R., 2016, “Analytical Methods for Determining Fire Resistance of Timber Members,” SFPE Handbook of Fire Protection Engineering, 5th Edition. White, R., 2009, “Fire Resistance of Wood Members with Directly Applied Protection,” Wood Design Focus, Volume 19, No. 2. David Barber is a principal with Arup; email: david.barber@arup.com.